Being sick at anytime isn't fun but when you are camping, then it just seems so much worse. You don't have your comfortable bed, and you don't have your bathroom right next to you (unless of course you are in a caravan with that feature). The days and nights (especially) can seem very long when you or someone you know is unwell. I don't think you appreciate your health until you are unwell and away from home. 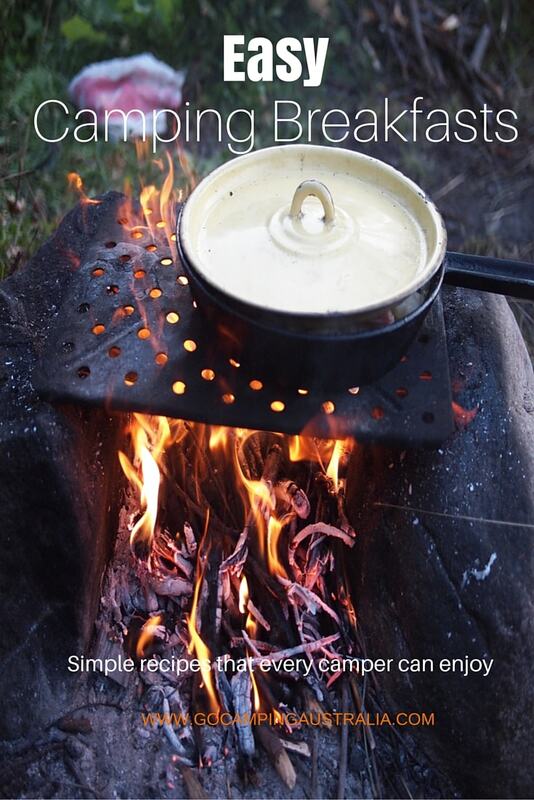 Firstly, it's going to depend on where you are camping. If you are camping in big resort-like campground in a big town/city, you will have many more options than when you are off the beaten track. 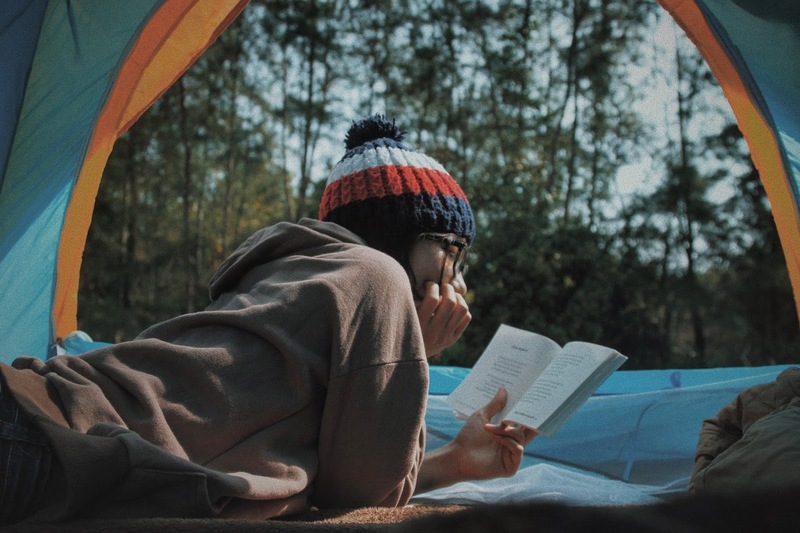 This story is more for those of you who are a little remote where you are camping and come down with the typical sort of illness such as gastrointestinal problems or cold/flu like symptoms. Here are our tips based on personal experiences. If the illness is going to affect the entire trip, pack up and go if this is an option such as weekend break. There is no point in hanging around hoping for a miracle recovery when you only have a short time to be camping. Depending on the illness, being in close quarters with the sickly one, could also mean that its contagious. eg. gastro is notorious for spreading quickly through families. Your camping trip is now going to be cut short, but really, with someone who is unwell (and I am not talking about a common cold), but someone who is really poorly, the best place for them would to be home and close to a doctor, if one is required. If you have any doubt over what is actually wrong with a person or symptoms increase, you should leave and seek medical attention. Always bring along a first aid kit. That should be part of your camping trip anyway. Apart from the usuals in a first aid kit (bandages, scissors etc), we take over-the-counter medications with us. And with kids, this is definitely something you should look at closely. Always use these medications as directed and if in any doubt how they could conflict with existing medications, ask in advance of any trip away!! Keep all medicines in cool and dry place and away from children. Pain relief eg. Panadol/Nurofen etc. If there is a fever, you will need to control it and these would be of help. Child appropriate medication. If your child can't take tablets, bring along pain relief in syrup form. Hayfever medication. Great for allergies which can make you feel totally miserable. Electrolyte sachets/tablets. When diarrhoea starts, your fluid intake is very important. Add to water to keep nutrients in system and your hydration up. Anti-diarrhoea medication. This is handy to have because if you can't get to the toilet easily, this can slow down your toilet visits. It's not going to treat the cause of your diarrhoea but just ease some of your discomfort. I have personally had to rely on this to make a camping trip bearable. So you have decided not to go home? Then rest up. Don't push yourself to do activities or anything that could exacerbate your illness. It might mean lying in tent/camper/hammock for the day, sleeping when your body needs it. Relax and get comfortable. No matter what the illness, your fluid intake should be kept up. With gastro related illnesses, this is vitally important. With fevers, sipping cool drinks can help. When ill, you don't want to make yourself worse due to dehydration. 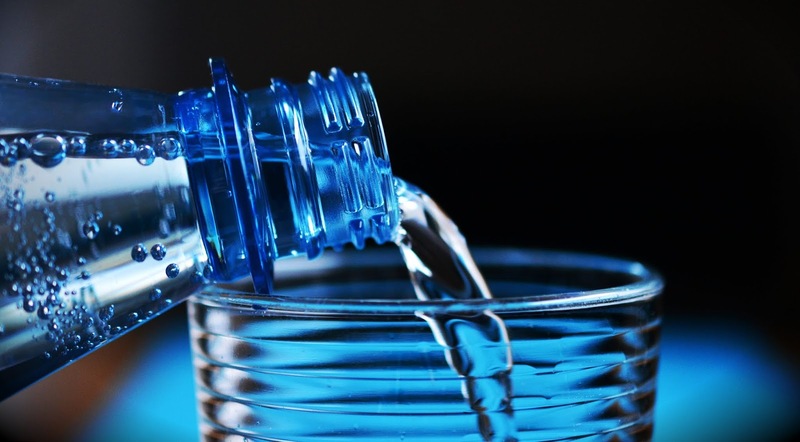 Sometimes it can be really hard to drink fluid (and I don't mean alcohol) when ill, but dehydration can sneak up on you, and children are especially vulnerable. Know the symptoms of dehydration and monitor yourself or the other sick camper closely. If you are staying at the campsite with your sick camper, then practice good hygiene. Have your hand sanitiser close by where everyone can use it regularly. No hand sanitiser - then wash hands with soap thoroughly and regularly. Cough and sneeze into a tissue which you can dispose of. If you are the unwell person - get someone to check on you regularly. If you are caring for the unwell person - monitor them regularly. You want to make sure there is no deterioration in condition eg. increased fever, change in symptoms, dehydration, pain etc. Based on this monitoring, you may have to go back to Point 1 - which is to leave your campsite and seek medical attention. As a camper, I have been ill when camping as have my children. It's not fun but thankfully, nothing serious. We have managed the illnesses at the campsite, but sometimes packed up a bit earlier than we had planned. With illness, sometimes you may have to use your common sense and your instinct. If something doesn't feel right, then trust your instinct and do something about it like leaving the campsite. If you are a parent, you know your child better than anyone else, and know when the illness is something mild and manageable (like a cold), but be alert for changes. 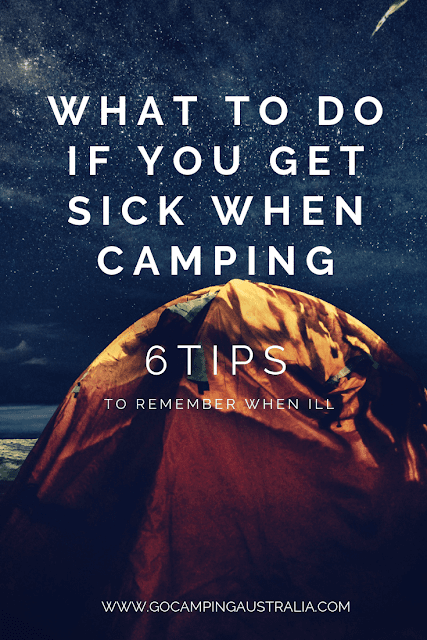 Illness when camping doesn't have to mean the end of your camping trip, but being prepared and aware of illnesses, is a good idea for every camper. Many of you started your camping by getting to your location with a car. 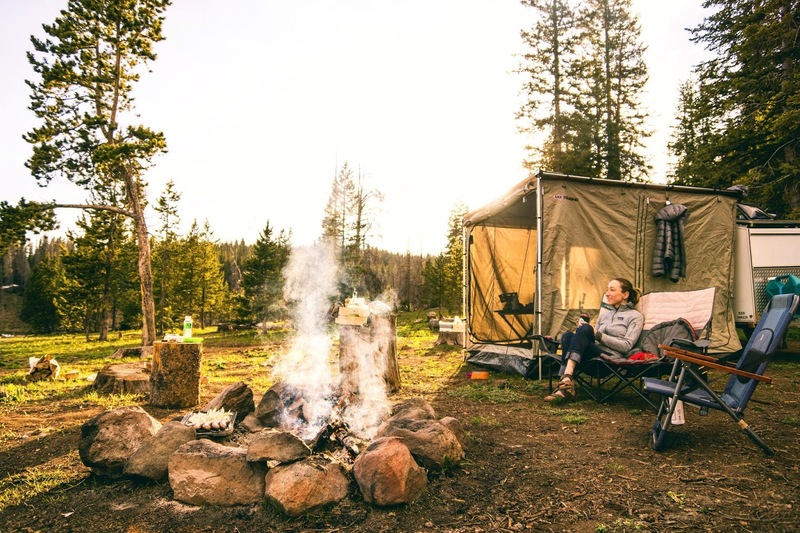 Having everything you want packed up in the car, with plenty of necessities and luxuries ready to make that camping trip relaxing and comfortable. It’s become the way I camp – I know that every camping trip, there needs to be a fair amount of prep work done before we leave; ensuring everyone has everything they need for the trip and planning for all sorts of contingencies that could arise. Consequently, the amount of gear that we as a family take, is quite impressive, even if its only for one night. But when hiker husband wanted me to hike in to a campsite (with no kids), just carrying whatever I needed for the overnight trek, it meant re-thinking the way I had camped previously. When you have to carry all your gear in a backpack, you do question what is really necessary and what is not. Just because we travelled light, didn’t mean there was no organisation leading up to the trip. On the contrary. The trip was planned with precision! Meals and snacks were discussed, cooking methods pondered and clothing options reviewed. Trial packs were done to see if I could bear the weight and strategic packing of the backpack to maximise all available space. Hiker hubby has trekked The Overland Track and other hikes before, so this was to be a simple stroll for him, but for me, a first-timer, it was an epic trek. Because of his previous treks and our love of good gear, we did have all the gear we needed to take on an overnight hike. Some of the gear we take car camping is considered lightweight, so that was lucky that we didn’t need to buy gear especially suited to backpacking. Typical car camping gear would have not only increased pack weight dramatically, but the size of the pack would have been enormous! When purchasing camping gear, you might want to think further than the next camping trip you have planned, and think to the future and the way you might want to camp later on, and buy accordingly if possible. I knew my limitations – I was no hiker. Anything uphill was going to be a big challenge. The overnight camp we were staying at, was a walk which many hikers do, as part of a longer walk, and was an established route. It was very hilly; not something I really wanted to hear, but taking my time, I believed I could manage. The weather was checked, and revisions made to our intended destination. Warm weather meant the hiking trail had been closed because of bushfire risk, so we had to re-think our hiking options, and find a hike that could be done without me expiring from heat exhaustion. Our shelter was MSR Hubba Hubba, a 2 person tent, which we think is a tent that is suitable for good warm weather, and easy to set up. It’s not the lightest tent to carry, but for this walk, it suited our needs. Our model has now been discontinued though you can still get variations on it. If we were going now, we would take something like the Big Agnes Copper Spur Ultralight, which is a good light choice for us. If it had been Hiker Husband alone, a hammock or something Ultralight would have been taken. We could have saved weight not taking the fly (pictured on the tent above), but just in case of rain we did take it. The photo below, shows the tent in its naked state. 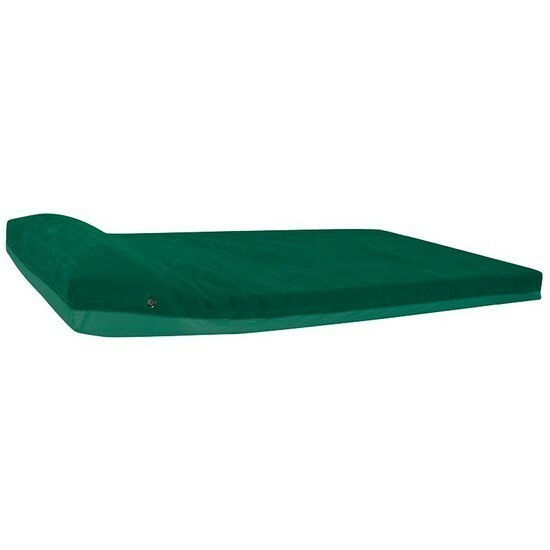 A comfortable night sleep is so important, and this is one area where I wouldn’t skimp on getting a good sleeping mat - whether you car camp or not. Not sure how to choose the right one? Then read our top tips for choosing a sleeping mat. 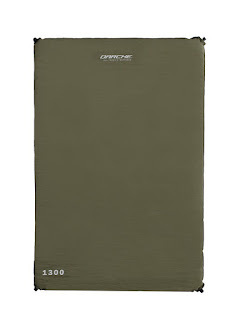 We had the Exped SynMat UL 7 and the Therm-a-Rest NeoAir Ultralight. 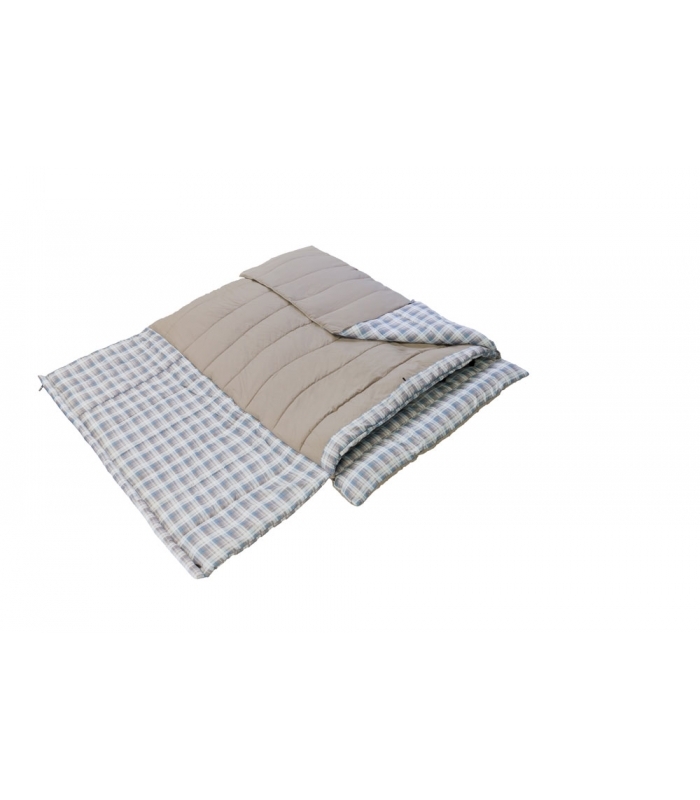 Both of these mats are comfortable, lightweight and pack up to a very small size. If you are not sure what to look for in a sleeping bag, here are tips to choosing a sleeping bag that you should read before purchasing. 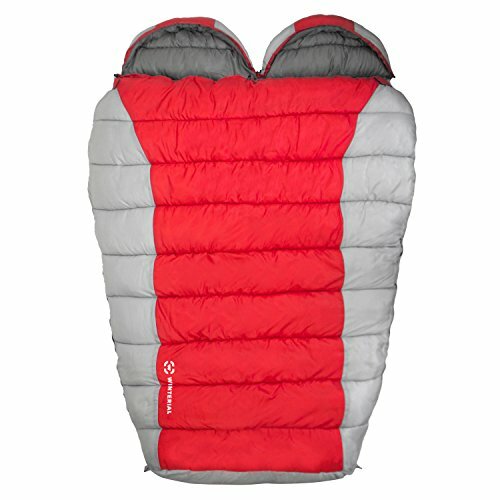 I used my Marmot Plasma 15 sleeping bag as the night was to be cool plus its lightweight (864g). Down sleeping bags are the best to purchase if you are going to be going hiking, as they compress greatly and really keep you warm (I had to sleep with it unzipped on this hike to prevent overheating). A good alternative to this bag in Australia (the Marmot mentioned came from overseas) is the Sierra Designs Nitro 800 Fill DriDown. You need to look for something light, so down is the most common choice. 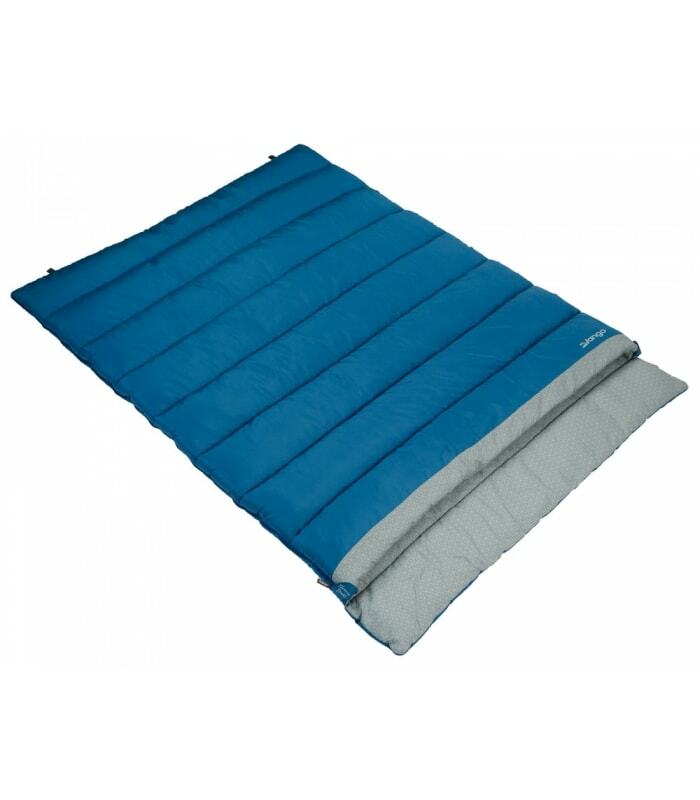 If you have a lot of money to spend on your 3 season sleeping bag, then the North Face Blue Kazoo is one you could consider. North Face too much? Have a look at the Sea to Summit Traveller which is considerably cheaper, but still lightweight and down. Husband used a top quilt by Hammock Gear. He was originally going to hammock camp, but I thought it would be easier to share a tent for that night. I got a new backpack by Osprey, and was keen to see how comfortable it was. Maybe I should have tried it out a little more before I left – but it didn’t matter in the end, because it was comfortable and I wasn’t too weighed down. If you need a good backpack (men or womens) we do use and recommend Osprey. They are comfortable, affordable and quality (far better than some of the big name brands you find in shops with the same name as the backpack - be cautious when going to those stores in case you end up with backpack that is just not suited for you and very heavy). Check out the full range of Osprey here - lots of different sizes available to suit you and your needs. As we had checked weather, we could see that the night was to be cool but not so cold I would need thermals. All clothing was quick drying and breathable (avoiding cotton). I did sneak in extra underwear and a clean T-Shirt for the next day, which was a little luxury, and I didn’t care if it meant a few more grams! Keeping hydrated is vital and our Osprey packs had bladders which we could utilise if necessary, but as the walk wasn’t that long, we did not fill the bladders. Instead we took 2 bottles with filtration devices, as we knew that the campsite had a dam – where we could use the bottles to safely filter the water. Not every place is going to have that option available, so taking plenty of water with you is very important part of any hiking trip. We were lucky to have some water options available to us. We were also able to use the Platypus® GravityWorks™ water filter which we took, which allowed us plenty of clean drinking water when at camp. This filter doesn’t take up any room, and is so handy! Just remember to take plenty of water with you on your hike and have a method to get clean water should you run out. Having a hiking stove is a key item to consider. We have a few to choose from, ranging from the complicated to the simple, and in the end we took the Evernew Titanium Burner and Stove, which runs on methylated spirits. Plenty of snacks too to keep energy levels high, but I didn’t eat much, as I was more thirsty than hungry. I know how important it is to eat well on a hike, so I would need to consider that as an area needing improvement by myself for future walks. And naturally coffee and milk (powdered and in small bag). We did use the MSR Mugmate to get our brewed coffee. Just because we are hiking and going lightweight, didn’t mean we had to drink instant. For a full range of what sort of coffee makers you could take on your trip, read our story on the top 10 coffee makers for camping and hiking. A luxury item was packed – red wine. We decanted a bottle and poured into this bladder and it was nice to sit around the campsite, and have a mug of red with our dinner. Purchase a wine bladder here and enjoy the good life when camping! If you don’t have hiking poles, I would think about getting them for any trek. They are a worthwhile purchase and they really helped me climbing down the hills, helping stabilise me. When not in use on a hike, our packs have spots where they are stored. You can see the hiking poles we used here if you are interested. If you are going to go to the toilet in the bush, you need to be responsible. In some places you are going to have take out everything – and that means your toilet waste! Thankfully, I didn’t have to do this on this trip (not sure I am ready for that), but you do need to take a trowel and toilet paper. No toilets where we were headed, and when you gotta go, you gotta go…..
Never near a campsite, away from all water sources, and in deep holes, well covered up. We used the Sea to Summit Pocket Trowel, which definitely does the job its meant to do! Lucky we were not weighing our packs religiously for this trek. We were carrying excess weight in chocolate. Have no idea why Hiker Husband packed so much, but was obviously thinking that I might have a chocolate craving of mammoth proportions and was afraid of my reaction should he fail to provide it in a remote location. And of course the wine, mentioned in the Food Section above! Wine is not a necessity apparently. Another luxury we allowed ourselves was a comfort item….a Helinox Chair One. Sitting around the camp at the end of the day (and for me, recuperating after the trek), we could have sat on the ground or a piece of Tyvek. But we had each brought one of these chairs, and whilst they added to our pack weight, how great was it to sit in one of these and relax? Overall, the first overnight hike by me was a success – I actually had a good time, and not having so much gear to think about, made the camping trip all about simplicity and getting back to basics (for me anyway). I am under no illusions that I am some sort of experienced hiker - it's going to take more than 1 walk to do that! There is no "Wild" book in my future where I hike the Pacific Crest Trail hike for self discovery..... though a subsequent book and movie deal is a highly appealing aspect. No, that level of hiking is not for me. The above list of items that we took is far from comprehensive, so if you are considering starting out on an overnight hiking trip, use our key items as a guide, but do build on this list by further reading. Additionally, I had the benefit of going with an experienced hiker, which allowed me to relax and not worry about every single thing needed, as I had someone who was prepared. Please note: This story was first published in 2015 but has had updated links added to maintain accuracy. There are so many sleeping bags in the shops you may be feeling slightly confused if you are about to buy a new one. We feel your pain. That's why we wrote a really good story on how to choose a sleeping bag (tips on what to look for when buying). It's a great starting point for you. If you are specifically looking for a double sleeping bag for your camping trips, we have a list of 8 tips that you should consider before buying. 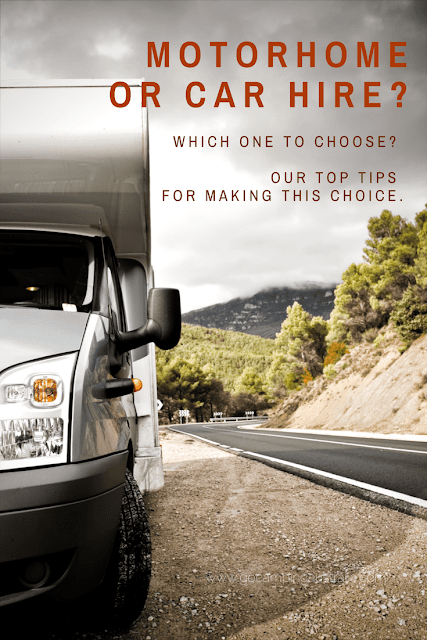 It's all about helping you make the best choice for your camping lifestyle. 1. Weight - Is it important to you? Weight is a consideration with single and double bags - especially if you are carrying your bag. If you are car camping, then weight isn't a huge issue for a double sleeping bag; you won't be counting grams, so this is possibly something you won't need to spend too much time deliberating over. But if you are hiking, you can still get double sleeping bags but they can weigh over 2kg, and in backpacking terms, that is not exactly light. One person is going to have carry that sleeping bag - the weight can't be shared unless you have a sleeping bag that can be zipped into 2 (see point 5). 2. Warmth - What temperatures will you be camping in? This is a BIG issue for any sleeping bag - single or double. Will it keep you warm? With doubles you do have the issue that there is a lot of space in the bag for air to circulate in. You might think you have the benefit of snuggling up to another person in the bag, which is true, but depending on the size of both of you, there is still plenty of air circulating around you. Unlike single bags, most of these double bags are without hoods that cinch around the neck area (trapping in the heat) so warm air is escaping (and cold air will seep in). Some do have simple hoods though but not necessarily the neck baffles that trap more heat in. 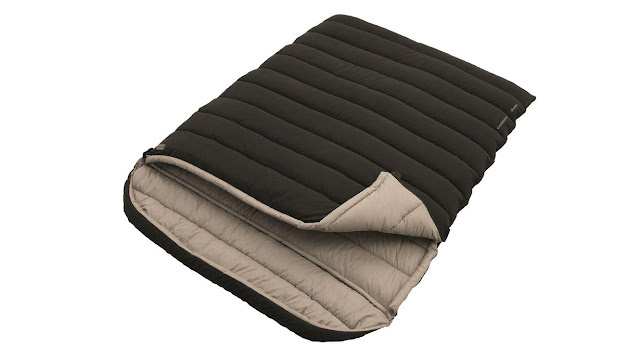 In the summer months, the less constrictive and more open sleeping bag could be a good thing, so a double sleeping bag could be a more attractive option in the warmer weather. Before you buy, think about how you plan on keeping warm. What is the rating? Is that rating right for the conditions you are sleeping in and factoring in that there is more room for cold air in a larger bag? 3. Insulation - What's underneath you? One place where a double sleeping bag could be the perfect option and where you don't have to worry too much about insulation is if you use it in a caravan or camper trailer. Then you will have your double bed already available! This is why double sleeping bags are often a great purchase for those of you with camping vehicles. 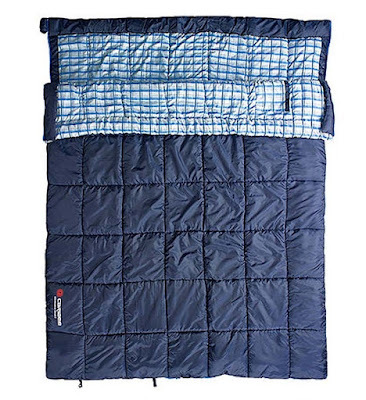 Sheets and blankets aren't a big requirement with a double sleeping bag. If you are going the double bag option and don't have a caravan/camper trailer, you will need to have adequate insulation beneath you that can accommodate the width of the sleeping bag. This might mean double self inflating mats or a double sleeping cot. Sleeping bag warmth comes from the bag, plus what's underneath you. Before you buy, think about what is going under your double sleeping bag. Do you need to purchase something else along with the sleeping bag? 4. Your sleeping partner - Good or bad? If you are planning on sharing this sleeping bag with another, a restless sleeper tossing and turning can impact on you, tucked up with them! They unzip to get out of the bed, then you will definitely feel that more than if you were separately ensconced in a single bag. Another factor to keep in mind - if you have no access to showers, one (or both of you) could stink, so no escape in that sleeping bag! Before you buy, think about who you want to cuddle up with and how you both like to sleep. 5. 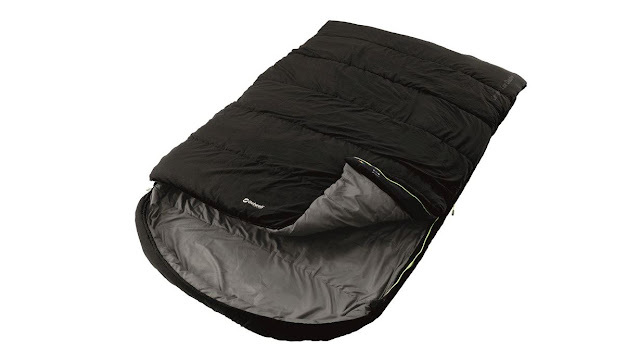 One double sleeping bag converts to 2 sleeping bags - Do you need this? 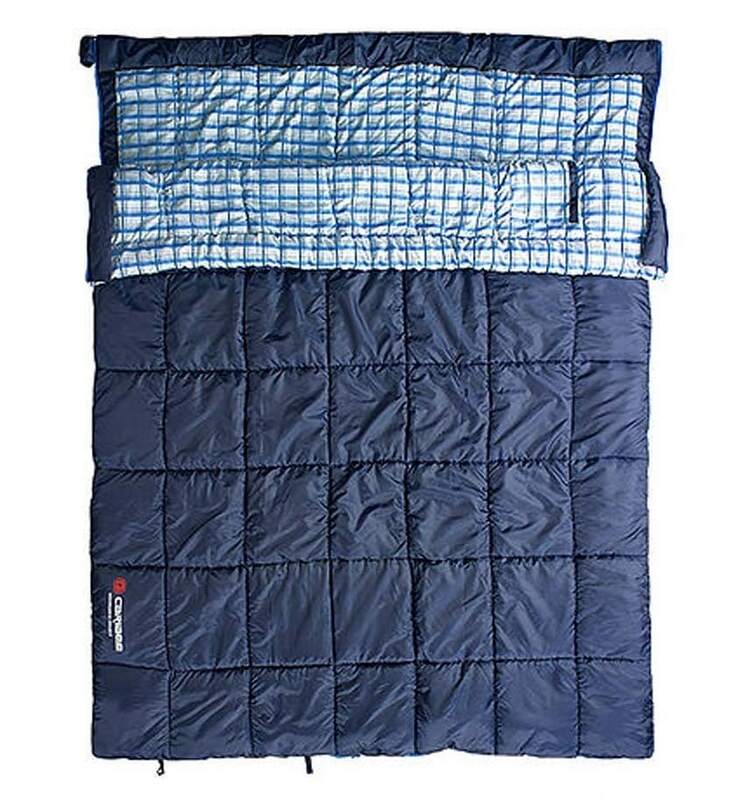 Some double sleeping bags can be turned into 2 singles. You still won't get that cinching around the neck as it will still be hoodless, but you can turn a double sleeping bag into 2 single sleeping bags with a few models. That way if one of you wants more personal space, its an option. Alternative - buy 2 single sleeping bags - one with a left zipper, the other with the right opening zipper, and then you could zip them together. But zips can be tricky, so it might all be a bit like hard work, but this is worth considering. Before you buy, think about if the bag can convert into two bags should your sleeping partner annoy the hell out of you (see point 4). 6. Space - How much roominess do you need? A benefit of the double sleeping bag is space - if you aren't a fan of the single (and sometimes quite tight fitting) sleeping bags, and like room to move in a bag, then a double could be beneficial. You can toss and turn without feeling constricted. You will need to take into consideration the sort of camping you do, if you are going to be warm enough with all that room. Another "space" tip to ponder - if you are using it for a tent, check that your tent can fit the sleeping bag adequately, and there is no centre pole getting in the way of your bedding set up. 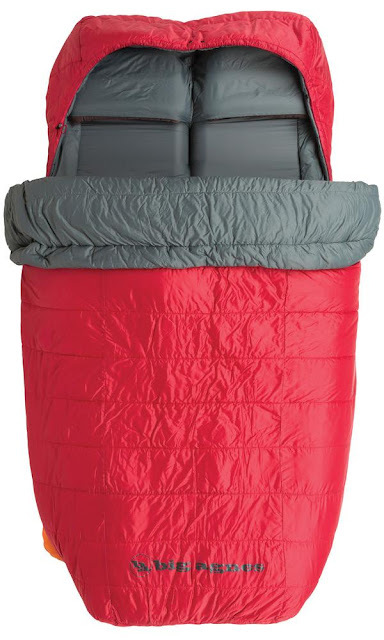 Before you buy, think about how you are going to warm up that sleeping bag with just one person in it. (see point 2). The weather conditions will affect this option; warm weather you won't mind as much being cooler. 7. Material - Synthetic or Down? Just like a single sleeping bag, double sleeping bags come in down and synthetic or a down/synthetic blend. And just like single sleeping bags there are benefits of each sort of of material. Read How To Choose a Sleeping Bag to see more about this. As many people who seem to buy these double sleeping bags, are car campers, a synthetic might be the best and cheapest option. Inside the bag is another consideration as well. Many double bags have a lining that feels like flannel sheets, others have a polyester feel. Before you buy, think about what material you want as that will affect the price you pay. If loft and lightness is your preference, down will be a good but expensive option. 8. Width - Will we all fit in it? Not all bags are the same size, but all are meant to cater for 2 average sized people. Check the sizing before you commit (and size up the people who will be sleeping in it). There may be a difference that just won't work. You can get a double bag that is mummy shaped (so wide at the top, but tapers in at the bottom) - but that means it could get a bit squishy depending on the size of the 2 people using it. Before you buy, read the dimensions of the bag you are wanting and make sure it's going to fit you and whoever else will be in the bag. Length and width. 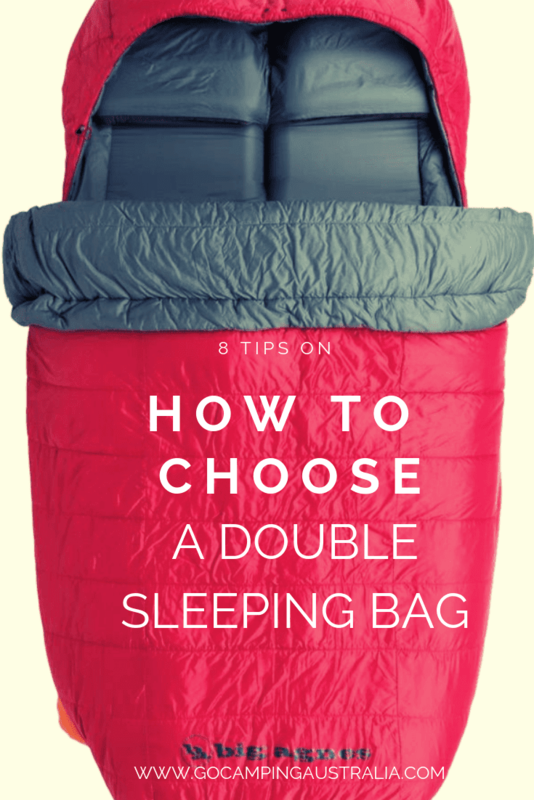 Before you buy, remember that choosing a double sleeping bag is like choosing a single sleeping bag. You need to do a bit of homework to get a bag that suits you and your camping style. 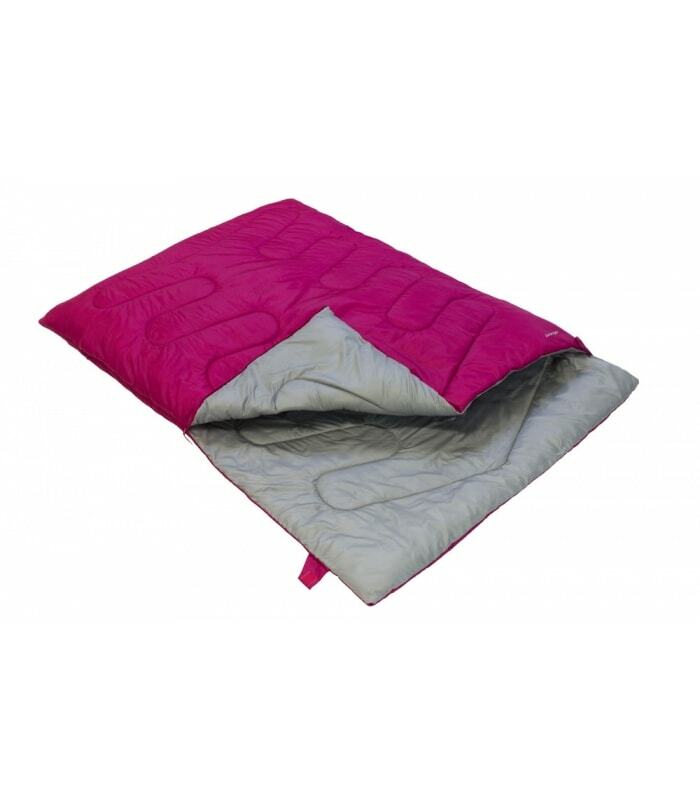 Double sleeping bags are a great way to get cosy (or romantic) with someone in the great outdoors. 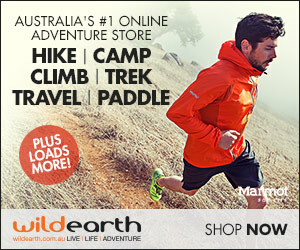 No Australian supplier but check with Winterial for shipping costs. All prices were correct at time of writing but are subject to change.